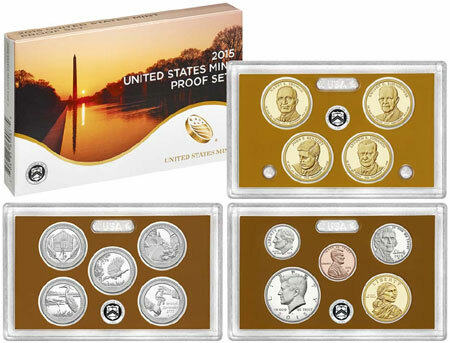 Today, March 24, 2015, the United States Mint started accepting orders for the 2015 Proof Set. The product features 14 different proof quality coins struck at the San Francisco Mint in their standard compositions. This year’s set features the sixth annual release of five coins from the America the Beautiful Quarters Program. The reverse designs of the coins feature Homestead National Monument of America in Nebraska, Kisatchie National Forest in Louisiana, Blue Ridge Parkway in North Carolina, Bombay Hook National Wildlife Refuge in Delaware, and Saratoga National Historical Park in New York. The set also features the ninth annual release of four coins from the Presidential $1 Coin Program. The obverse designs of the coins feature portraits of Presidents Harry S. Truman, Dwight D. Eisenhower, John F. Kennedy, and Lyndon B. Johnson. Additional coins included in the set are proof versions of the 2015-dated Lincoln Cent, Jefferson Nickel, Roosevelt Dime, Kennedy Half Dollar, and Native American Dollar. The 14 coins are encased in three clear plastic lenses and housed in a newly designed outer carton accompanied by a certificate of authenticity. The sets are priced at $32.95 each plus applicable shipping and handling. There are no product or household ordering limits imposed. My proof set has the Kennedy Half upside down ! Only Me?